Bee's have pretty buzz-worthy reputations. Either everyone touts them for being majestic pollinators in need of saving, or they get villainized for simply trying to protect themselves. But you don't buy it. You see bees for what they are—tough little cookies with a cool job to do (hey, that kind of sounds like you)! They work hard, travel constantly, produce delicious treats, and don't like to be messed with. Bees are just plain cool! 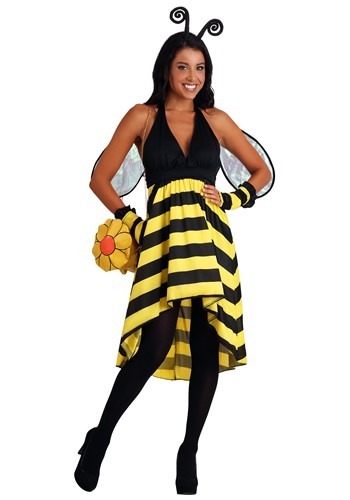 That's why this Women's Bumble Bee Beauty Costume is the perfect mixture of tough and sweet for your Halloween. You practically fell wings over stinger for it when you laid eyes on its feminine silhouette and classic bee coloring and styling. In it, you can already see yourself flitting about from party to party, causing quite a stir! Sounds perfect for a social butterfly such as yourself (oops, we're mixing metaphors, but you get the point). 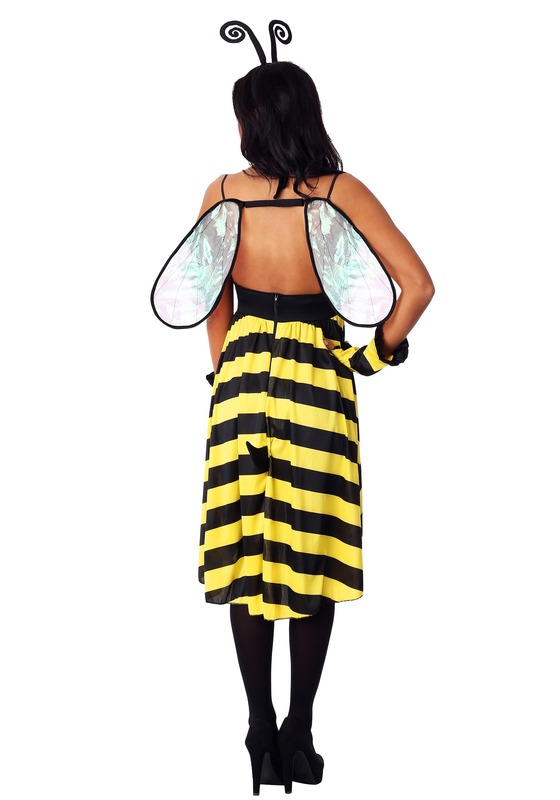 This exclusive costume will generate buzz wherever you wear it. Time to revolutionize the dichotomous bee reputation for good! Our costume studio turned on their best hive mind to design this costume for you—they really came together! This is a set of duds intended to make you feel your most bee-autiful. The halter dress boasts a black bodice and a yellow-and-black striped high-low skirt. Lightweight wings slip over your shoulder, helping you take flight for the night. Add the antenna and fingerless gloves and carry a pot of honey or flower purse for a look that's as lovely—and feisty—as you are. Don't let other partygoers cower in unnecessary fear as you stroll by. And don't let them lecture you on the plight of the honeybee. Tonight you call the shots (and anyone who thinks differently can answer to this costume's black stinger on the back)!